Go Wild! Youth for Conservation is a 5 day leadership day camp for youths aged 10-17 that provides the opportunity to learn and experience the outdoors in a safe and supportive atmosphere. Inspiring our conservation leaders of tomorrow, the BCWF Go Wild Youth for Conservation camps have been running since 2013 and give kids a hands-on learning opportunity to learn outdoor skills and a foundation of leadership they will use throughout their lives. All conservation projects are “real life” initiatives that aim to benefit the host community. Be it wildlife habitat restoration, invasive species removal, building bird and bat habitats, tree planting, trail clean up and maintenance. Our BCWF Go Wild camps spark interest in the youth to participate in or even lead similar projects after Go Wild. Each camp curriculum is region-specific and tailored to the local area meaning no two Go Wild camps are the same. This year, we reached a total of 31 youth in the community of Rock Creek and the surrounding area. Camp was offered for a low cost of $50 for a 5-day camp, which included lunches, to lower any barriers that might prevent youth from being able to attend Go Wild. A trial overnight component was to be added in the planned Lake Country camp, though due to a serious car accident, the Lake Country Go Wild camp had to be cancelled last minute. The Rock Creek camp included base programs combined with place-based programming. Place-based programming incorporates local attractions and venues in developing a program. By using this design concept, the Go Wild camp was unique and allowed campers to discover local “eco” attractions that some never knew existed in their community. Examples of place-based programming in 2018 included visits from local experts, float tubing, hiking a section of the Trans Canada Trail and fishing at a local lake. Go Wild Rock Creek ran from July 23-27 and was hosted by the Kettle Valley Wildlife Association. Like Go Wild Dawson Creek 2017, this Go Wild Rock Creek was open to a wider age range of 9-17 to maximize the interest of campers from the previous year’s Wild Kidz Rock Creek. 31 campers registered for the camp and 4 of which were sponsored by local organizations in the area. Camper had a very diverse week learning about communication, leadership, and wildlife (e.g. cervids, waterfowl, and BC Fish). Go Wild Rock Creek also incorporated a unique range day that included NASP archery, trap shooting, and .22 competition that lasted an extra after the camp. The camp was also visited by local RCMP and Conservation Officers who spoke on gun safety and local conservation issues. The camp finished off with trail clean-up of the Rock Creek section of the Trans-Canada Trail. Go Wild Rock Creek made possible by contributions from the Boundary District Teachers’ Association, Rock Creek Lions Club, A1 Buses Ltd, West Boundary Community Forest, BC Conservation Foundation, Wildlife Habitat Canada and the 18 volunteers who helped throughout the week by donating 336 hours of their time! Go Wild Lake Country was scheduled to run from July 16-20, 2018. Unfortunately, due to a serious car accident involving the camp truck and two of the youth camp staff on July 14th the decision was made to cancel the Lake Country Camp. The BCWF is happy to report that all the two staff member involved suffered minor injuries and are recovering well. At the time of cancellation there were 22 registered participants, ages 10-14, all of who were issued full refunds. 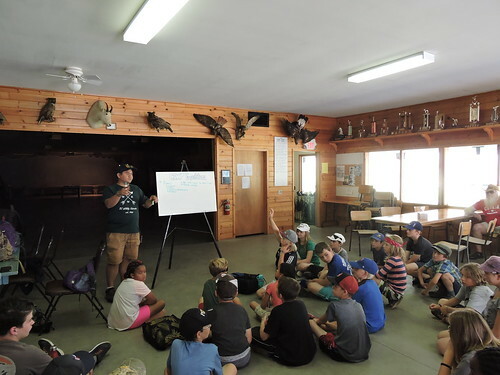 The camp was to be hosted by the Oceola Fish and Game Club with in-kind support from the local partners the Okanagan Forest Taskforce, Bluestar Coach Lines, Camp Arbuckle, and Castanet. Scheduled program included fishing, hiking, a career presentation by local conservation officers, urban trail restoration in collaboration with the Okanagan Forest Taskforce, and the pilot of our first ever overnight component. We would like to express special thank yous to the BCWF volunteers who helped our staff during the aftermath of the accident. We also extend our apologies to the families and campers of Go Wild Lake Country for cancelling the camp and reassure them that we intended to return to the Okanagan in 2019. Get youth outdoors! Support Go Wild TODAY!